Xantrex Technology Inc. has released its second generation Freedom HF Inverter/Charger to the North American Commercial, RV and marine markets. 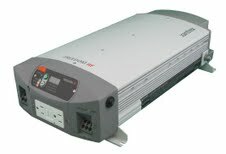 The original Freedom HF series made its debut in 2008 as one of the lightest, smallest and most affordable inverters/chargers on the market. In keeping with the company’s continued commitment to quality engineering, innovation and customer satisfaction, the new Freedom HF was conceived, developed and is now available with customer-driven enhancements in the areas of ease of installation and efficient battery management. The new Freedom HF now sports a 1000W model with a 55A charger for large battery banks that may demand powerful charging output, in addition to the upgraded 1000W/20A and 1800W/40A models. A top enhancement includes a quick-connect AC terminal block on both AC input and output for easy wiring and fast installation, eliminating the need for strain relief clamps. Another key feature is the ignition lockout which disables the inverter when the ignition is turned off. This helps to minimize unnecessary battery drain. In addition, GFCI and hardwire options provide greater flexibility for easy plug-in directly on the unit, or hard wiring connections for AC power. Xantrex Director of Sales John McMillan indicates the Freedom HF series offers multiple advantages when compared to other brands, as well as to its best-selling predecessor. “While the latest generation Freedom HF maintains the same winning DNA including its compact size, advanced features and affordability of the original Freedom HF, the additional new features sets it in a class all its own,” he said. “The Freedom HF Series performed exceptionally well in its respective mobile markets in numerous operating environments, so with these new enhancements, we are confident in the future of this upgraded product offering. The launch of these new generation products stems from our commitment to quality and exceeding customer expectations,” he added. All models are certified to meet UL458 for mobile applications and FCC, Class B requirements for better EMI performance. As part of its continued commitment to providing educational solutions for electronic enthusiasts while leveraging the latest social media platforms, Xantrex Technology today announced the launch of TECH DOCTOR LIVE! This new online video library housed on the Xantrex YouTube channel complements the previous print-only “Tech Doctor” editorial series which has been supplied to media outlets and partners, to rave reviews. A wide range of topics have been repurposed for the video channel, with more planned for the future in both print editorial and video applications. Xantrex takes special care to ensure these quality programs focus on education. Besides authoring the Tech Doctor series since its launch, Wilson has delivered multiple presentations and seminars at industry trade and consumer shows for several years. “I’m excited that Xantrex decided to ramp up the program in this manner and based on the feedback received to date, I believe it will be well received by consumers in the markets we serve,” said Wilson. In addition to TECH DOCTOR LIVE, the past two years have been significant for Xantrex from a marketing perspective. The company has launched a totally re-designed website as well as key social marketing initiatives such as Twitter and YouTube. In addition, Xantrex also launched Xnews, a regular online e-newsletter for customers and prospects which is e-blasted to a growing opt-in trade and consumer database.